I don't know was it a fortunate thing that I got a little helper this time - my nephew. :P I was worried that he would mess things up cos' I knew he just wanted to play and I also have to give him instructions which I thought, things would move faster with me doing it alone. ;) Nonetheless, he's a great help to me in double sifting of the flour and I could see him enjoying himself as he mixed the batter for me and weighed the ingredients. But he soon got bored after a while and I caught him pouring some remaining flour intothe bowl without sifting! Children are indeed so clever nowadays! I used to call him "my little nephew" but he is not now. 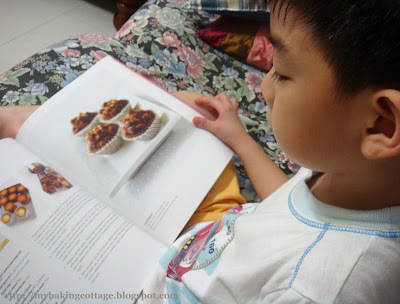 He is going to primary one next year and he is a big brother to his younger brother, who is more playful than him! The recipe was beautiful. I hardly had a sponge cake that came out perfect with no cracks. ...and the sponge cake texture was extremely soft and crumbly. I don't think for this recipe, you can slice the cake into three layers otherwise the layers would break apart. As stated in the recipe, I sliced into two layers. As the texture was very soft and spongy, it absorbed the syrup very well, just like an absorbant sponge. 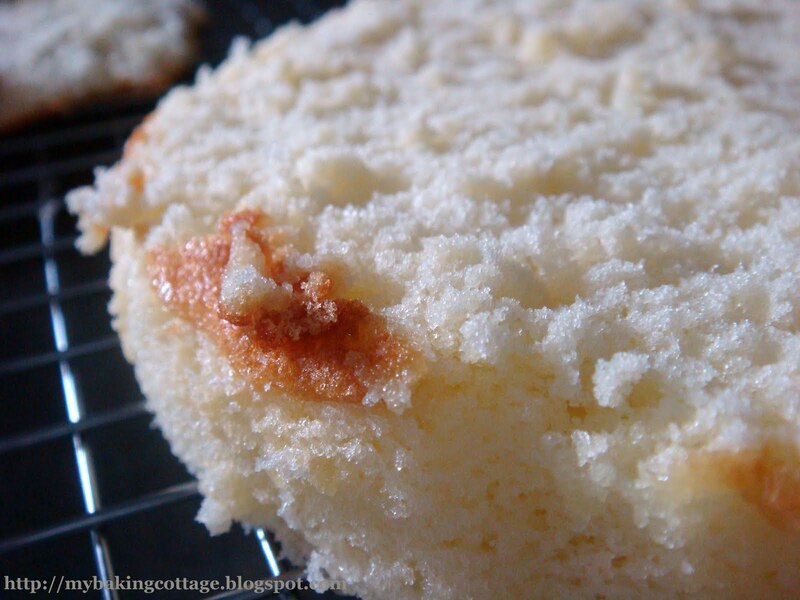 After chilling, the sponge cake taste very refreshing, and remains moist and soft. 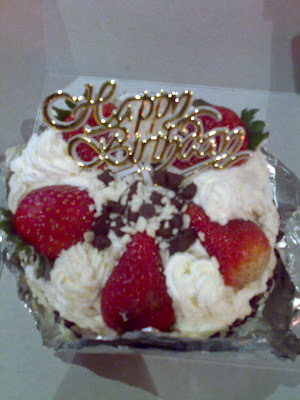 The two layers was sandwiched with vanilla cream and fresh strawberries, frosted with freshly whipped ream. Preheat oven to 170°C. Line cake pan with parchment paper. Sift flour twice. Beat eggs with a whisk, then add sugar and glucose. Place bowl over a double boiler and mix well. When egg mixture is warm, use an electric mixer to beat on high speed until light and fluffy. Reduce speed to low and continue beating for about 1 minute. Place butter, milk and vanilla in a bowl and place over a double boiler until the butter has melted, stir through to mix. Add 1/6 of egg batter to butter mixture and mix well. Then add butter mixture to remaining egg batter and fold through evenly. Sift flour into bowl and fold using a spatula until batter is glossy. 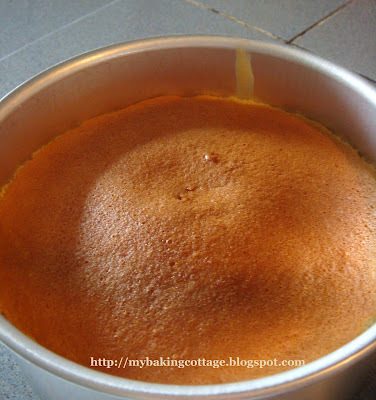 Pour batter into prepared cake pan and bake for about 40 minutes or until cake has a bouncy texture at the surface. Remove from pan and place on a wire rack to cool. When cooled completely, trimmed off the top crust, and slice the cake horizontally into two layers. Place one layer on a flat tray and brush evenly on both sides with 1/3 of the sugar syrup (to make syrup, use 25g castor sugar and 50g water). Set aside. Make vanilla cream. Whip cream in a chilled bowl until stiff peaks form. Place milk, sugar and vanilla in a small saucepan and bring to a boil. Add softened gelatine and mix well. Let milk mixture cool to about 30°C. Add milk mixture to whipped cream and fold until just incorporated. Slice strawberries (about 300g) lengthwise. 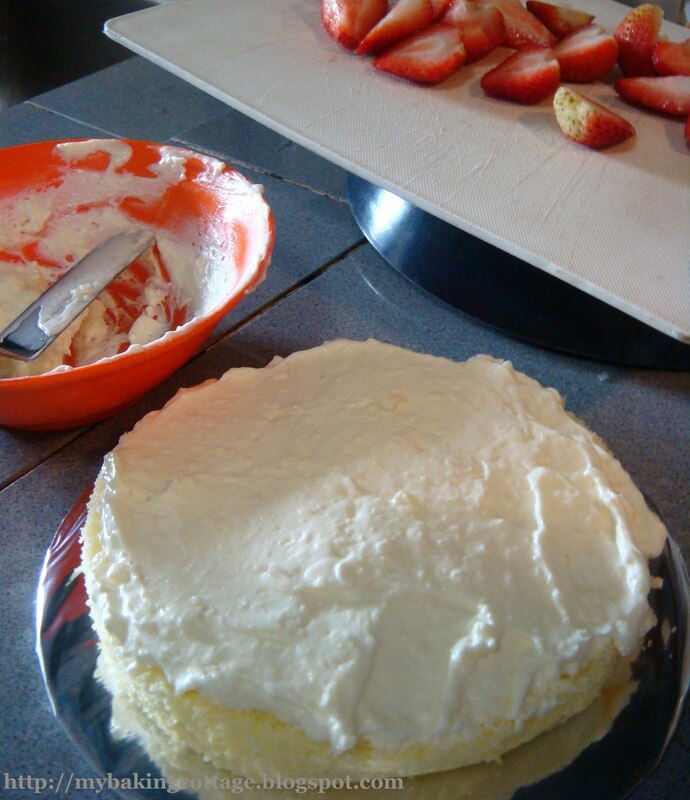 Spread vanilla cream onto the layer that was brushed with the sugar syrup, then topped with strawberries. Place the other cake layer over and press down lightly. Chill in the fridge for a few minutes to set. Make whipped cream. Whip cream, sugar and vanilla in a chilled bowl until stiff peaks form. 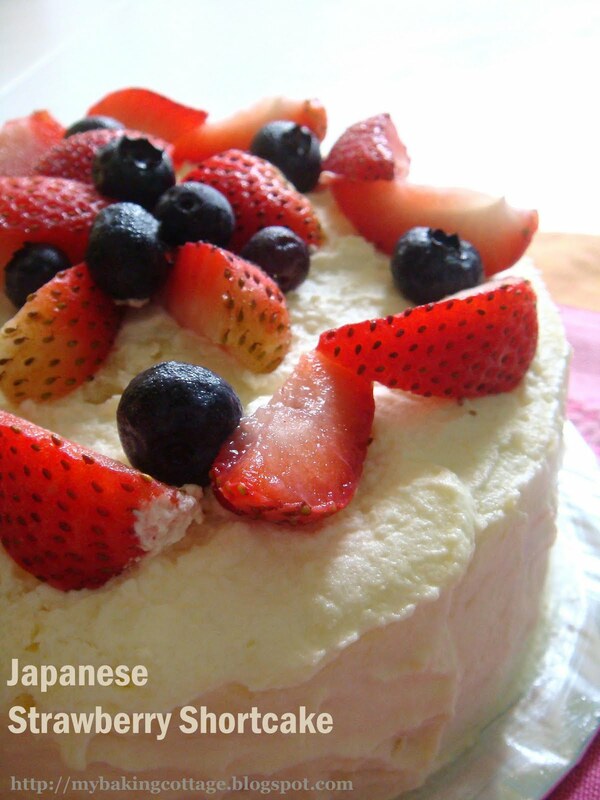 Cover cake with whipped cream and garnish as desired. 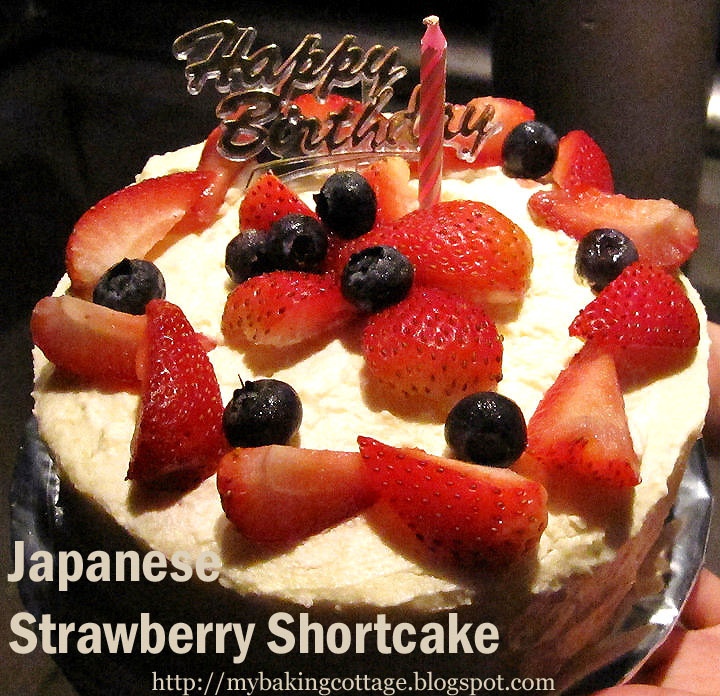 Aimei, I'm a huge fan of Asian-style fruit cakes, be it Japanese strawberry cake or Chinese (Hong Kong) fruit cake. I prefer a refreshing approach to fruit cake. That's why Western rum-flavored fruitcake has never been my fave. Too rich and heavy for me! I love yours! Looks so good! Aiya, I sometimes also look back at my old creations lar ... Couldn't help but chuckle. Most importantly, it's your folks that love what you've prepared for them! Your hubbs is so damn lucky to have you! Btw, HAPPY BELATED BIRTHDAY to your sis! Good job. The texture of the sponge cake looks so delicious. Yay, your cake survived all that transportation. Aimei Happy Belated Birthday to your sis. The cake looks so beautiful and the sponge cake is so soft, yummy. If you want to slice cakes into thinner layers, doing it with a cake leveller would be easier. Its harder using a serrated knife, from my experience. btw, got whipping cream, fresh cream ... the whip cream cannot come from fresh cream ? Where can you buy glucose in Spore? I never seem to find it. Does Daiso have it? that looks really soft and fluffy! Sherlyn: I find that different people use the term fresh cream differently. Since in this recipe it did not state whipping cream, I guess it refers to heavy cream that can be whipped. But for this recipe, I used the same whipping cream as I did for vanilla cream. Thanks Bakertan! I have yet to buy the cake leveller but will look out for it. :) I saw your post on the instruction. Shirley: yes even though he can real noisy at times when I'm baking cos' any lost in concentration can lead to disasters, you can't help when you see how sweet and innocent kids are. happy Birthday to your sister. The cake is so beautifully decorated. I like it. Thanks very much for sharing. Cool story as for me. I'd like to read more about this topic. The only thing your blog misses is some pictures of some gizmos.